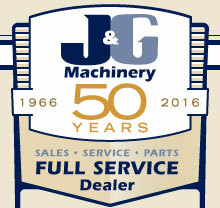 Service | J & G Machinery, Inc.
To schedule a service call, call 919-776-8341 or email service@jgmachinery.com. All calls will be made as soon as possible, subject to prior commitments and scheduling backlog. 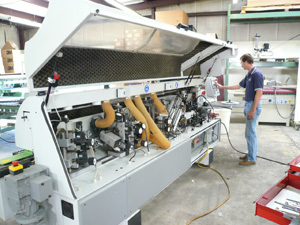 Priority is given to customers who purchased their machine from J & G Machinery. Normal hours are 8:00 AM to 5:00 PM, travel included. Time worked before or after these hours will be billed at time and one-half the normal rates above. All traveling and living expenses (airfare, lodging, parking fees, tolls, ground transportation, meals, and miscellaneous expenses) are additional and will be billed at cost. TERMS: Due upon completion of work. Service pertaining to less sophisticated, non-computerized woodworking machinery. Service of sophisticated, often computer-controlled, woodworking machinery. Any questions regarding "Level of Service" should be discussed with the Service Department prior to scheduling. Note: Service travel times are from Sanford, Denton or Dallas in North Carolina and Cleveland in TN or the last job site. Technicians are scheduled according to their area of specialty, not their geographic location. We will do our best to reduce cost related to travel time if at all possible and if scheduling permits.